Reverberation chambers have made a significant impact on the nature of EMC testing and this work provides a strong theoretical and practical basis for understanding many aspects of their application. Reverberation chamber theory and applications remain an important area for continuing scholarship. This is evident in a recent EMC Newsletter article where it was indicated that two of the ten most downloaded IEEE Transactions on EMC papers from IEEE Xplore as of April 2009 were related to reverberation chambers. In fact, Hill’s work related to reverberation chambers has been highlighted in EMC Newsletter issues No. 220, 221, and 222 as the 7th, 8th, and 9th most referenced papers of the IEEE Transactions on EMC. David Hill’s synopsis of reverberation chamber theory and applications is an important summary and focal point for researchers either developing new procedures or for newcomers to the ideas connected with reverberation chambers and statistical electromagnetics. This text provides an excellent summary of reverberation chambers with a good balance of theoretical and measurement results. The book weaves together Hill’s published works in a logical and interesting manner. This long awaited text brings together many of Hill’s well developed works in a coherent and complete manner. Part 1 (Chapters 1–4) covers classical deterministic methods to describe analytically the resonant frequencies, modal fields, and losses. The quality factor and mode bandwidth along with cavity excitations from arbitrary current distributions are presented for rectangular, circular cylindrical, and spherical cavities. A general introduction to Part 1 provides the roadmap to be followed in each of the sections to follow. Part 2 (Chapters 5–11) describes statistical theories for electrically large cavities and includes a brief motivation for statistical approaches and a summary of probability theory necessary to understand EMC testing in a reverberation chamber. The implications of reverberation chamber theory when connected to related fields such as wireless communications are also presented in Part 2. 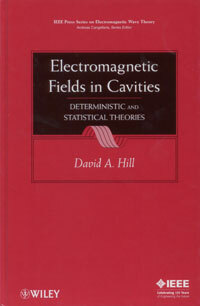 Chapter 1 provides a review of Maxwell’s equations, a discussion of empty cavity modes, and the time averaged electric and magnetic energy density for a general cavity shape. The notion of wall losses is presented as an average of the local wall currents and a discussion of the chamber quality factor (Q) is presented. Procedures for cavity excitation are presented with the discussion of the application of the dyadic Green’s function. Chapters 2–4 present the specific application of the ideas of Chapter 1 to rectangular, cylindrical, and spherical geometries where detailed expressions for resonant frequency, Q, and the required Green’s functions are presented. Chapter 5 presents a motivation for using a statistical approach and its connection to wireless communication issues. A discussion of the sensitivity of the fields to cavity geometry establishes the small changes needed for modal structure changes within the cavity – essential for proper chamber operation. Chapter 6 provides the fundamentals of probability – though not exhaustive – it does provide the details needed to develop and apply probability density and cumulative distribution functions. Chapter 7 provides an overview of reverberation chambers and explicitly describes the application of mechanical stirring to randomize the fields. Following a discussion of the plane wave integral representation of fields (the 8th most referenced IEEE Transactions on EMC paper) the ideal statistical properties of the fields are discussed. Probability density functions for the fields are developed based on the underlying Gaussian distribution. Measured results from the National Institute of Standards and Technology (NIST) on NASA Langley’s chambers are used to provide the essential connections to practical considerations. Spatial correlation functions are defined to provide an understanding of equipment in a reverberant environment. Antenna and other equipment responses relate the effective aperture to the average received power. A discussion of the determination of chamber Q is presented that compares calculated and measured loss in a mechanically stirred environment using both steady state and decay time measurements. The application of reverberation chambers to emissions measurements is presented based on reciprocity concepts. Chapter 8 is largely an expansion and extension of the 7th most referenced IEEE Transactions on EMC paper by Hill related to the aperture excitation of electrically large, lossy cavities to the ideas of measured shielding effectiveness. Driven by the assumption of energy uniformity for the clearly overmoded cavity, the theoretical discussion is validated by a series of shielding measurements. Chapter 9 presents an extension to the uniform field model in the context of frequency stirred fields and Hill’s paper on electronic mode stirring (the 9th most referenced IEEE Transactions on EMC paper!). The connection of unstirred energy in the context of loading and a discussion of an alternative probability density function is presented. Chapter 10 presents a number of further applications of reverberation chambers including the use of nested reverberation chambers for shielding effectiveness measurements, the measurement of antenna efficiency, and absorption cross section. These application areas are important extensions of reverberation chambers outside those of traditional EMC standards-based testing. The book concludes with Chapter 11’s focus on reverberation chamber applications to indoor wireless propagation where the multipath effects can be controlled and “sourced” by careful application of reverberation chamber ideas. Traditional path loss models and temporal effects (delay spread) are presented for moderate and low Q rooms. End of chapter problems for each chapter provide a useful set of exercises that may serve as an effective tool for application in a graduate level EMC course. Appendices include a discussion of vector analysis, associated Legendre and spherical Bessel functions needed for analysis of spherical geometries, a discussion of the role of chaos in cavity fields, the responses of short dipole and small loop antennas, ray theory for chamber analysis, absorption by a homogeneous sphere, transmission cross section of a small circular aperture, and scaling. The references are quite good and include 192 cited references as well as numerous related references on general cavities and applications, dyadic Green’s functions, reverberation chambers, aperture penetration, and indoor wireless propagation. Chuck Bunting received the A.A.S. degree in electronics technology from the Tidewater Community College, Virginia Beach, VA, in 1985, the B.S. (honors) degree in engineering technology from the Old Dominion University, Norfolk, in 1989, and the M.S. and Ph.D. degrees in electrical engineering from the Virginia Polytechnic Institute and State University, Blacksburg, in 1992 and 1994, respectively. From 1981 to 1989, he was with the Naval Aviation Depot, Norfolk, first as an apprentice, then an electronics mechanic, and later an electronics measurement equipment mechanic. From 1991 to 1994, he held a Bradley Fellowship and a DuPont Fellowship. From 1994 to 2001, he was an Assistant/Associate Professor at the Old Dominion University, where he worked closely with the NASA Langley Research Center on electromagnetic field penetration in aircraft structures and reverberation chamber simulation using finite element techniques. Since 2001, he has been an Associate Professor at Oklahoma State University, Stillwater. His research interests include fundamental variational principles and computational electromagnetics, statistical electromagnetics, electromagnetic characterization and application of reverberation chambers, and the analysis of optical and microwave structures using numerical methods including finite element techniques. He is currently chair of the EMC Society TC-9 (Computational Electromagnetics). WANTED: EMC Books to Review! The “Book Review” columns that are published in the EMC Newsletter are a great treasure for all of us. They give us the possibility to be informed of the existence and contents of published books that are of interest in the wide range of topics covered by our common technical and scientific interest: Electromagnetic Compatibility. The large number of books published on EMC related topics per year makes it impossible for a mortal Associate Editor to be acquainted with all of them. Because of this, I wish to ask you for your help. Please indicate the author(s), the book title, the publisher, the ISBN and a brief description and/or your comments on why you feel the book should be considered for review in the EMC Newsletter. This will help me very much in considering books for review and hopefully increase the number of book reviews made available to our community. Thank you in advance for your help and time! The author team for this book consists of a leading expert systems designer (retired) and a senior academic. The result is a serious book that contains theory, simulation, and models, along with “real life” examples. This book can serve as a text book intended to be read from cover-to-cover, or as a reference for the design engineer. When designing high-speed digital systems, the topics of signal integrity and radiated emissions are truly joined at the hip. This fact may not be fully appreciated by some design engineers, or more commonly, by their managers. Hopefully, this book provides a tool that is a useful blend of topics that can assist in an overall understanding of the pertinent physics and design issues. The book contains numerous results of full wave simulations as a means of illuminating the particular point at hand. An added bonus this book supplies is an assortment of downloadable on-line formulae and models in MathCad and MicroCap formats. Chapter 1 is an introduction to signal integrity and radiated emissions considerations in a digital system and is packed with information. In this chapter, the concepts of signal and power integrity are introduced along with the power distribution network (PDN) of a printed circuit board (PCB). 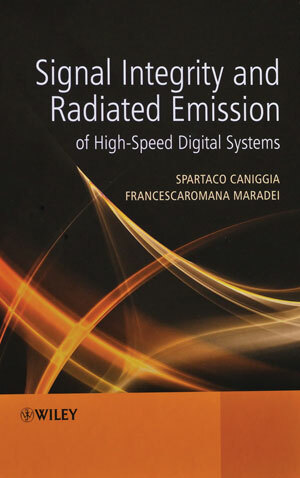 The concepts of radiated emissions along with types of emissions sources associated with digital systems are introduced. Emissions standards are discussed in terms of contemporary CISPR and FCC standards, although the reader must realize that standards change over time so discussions in any printed text may not remain current. There is an interesting section with an example of a radiated emissions signature from a “real” system. The authors make a valuable observation that the emissions profile from a complex system is generally not due to the sum of the many emissions sources present in the system, but rather may be the results of a single source that may not have been properly designed. This chapter also provides an introduction to modeling methods and tools which the authors view as basic tools in understanding signal integrity and emissions behavior. Chapter 2 discusses the details of three categories (TTL, CMOS, and ECL) of high-speed digital devices, including equivalent circuits and I-V characteristics. Driver and receiver models are covered, including the IBIS behavioral model and its use in SPICE. Chapter 3 covers the all important topic of inductance. The concept of partial inductance is introduced. The authors have included a short section on “Solving Inductance Problems in PCBs,” in which the inductance between an integrated circuit (IC) and a nearby decoupling capacitor is examined. Chapter 4 covers capacitance, including an introduction to even and odd mode capacitances. Chapter 5 provides methods for predicting reflections in interconnects with digital devices. Included is a summary of signal distribution structures and recommended termination types. Also included is a summary of the performance characteristics of various termination types, which is intended as design guidance. Chapter 6 provides a detailed examination of crosstalk among traces on a PCB. Even and odd modes of propagation of multi-conductor transmission lines are introduced and an exact SPICE model is presented for two coupled lines. Guidelines are offered for reducing crosstalk on a PCB. Chapter 7 considers lossy transmission line characteristics with the aim of facilitating the simulation of lossy lines in the time domain (with the frequency dependent characteristics of some parameters). Topics include skin effect, proximity effect, lossy dielectrics, and data transmission along lossy transmission lines. Two methods are given which allow time domain (transient) simulations when non-liner loads are involved. Chapter 8 offers an extensive discussion on PDN noise caused by switching digital devices. This is a very important topic for designers of multilayer PCBs intended to operate with high-speed signals. This topic is not always well-understood in the design community. The important role of inductance in the effectiveness of decoupling capacitors is discussed. Design rules are offered for the use of decoupling capacitors, power/ground distribution, and selection of digital devices. Strategies for the selection of decoupling capacitors are discussed. Models for predicting the PDN impedance and resonant frequencies are given. Results from simulations and measurements are given. vChapter 9 is devoted to radiated emissions from PCBs and attached cables, a fundamental topic in understanding sources of radiated emissions from modern digital systems. Common and differential mode currents and associated radiated emissions are discussed and a summary in terms of practical behavior is given. The authors include an interesting section on emissions from a real PCB, followed by discussions of the mechanisms of emissions from a PCB with attached cables. The chapter concludes with points to remember and design rules. Chapter 10 is titled “Grounding in PCBs,” but also discusses signal return path considerations, split planes, moats, bridges, power islands, shorting vias, and EMI filters. Simulations and measurement results are given. The chapter concludes with an extensive section on points to remember and design rules. Chapter 11 discusses two primary measuring instruments, the time domain reflectometer (TDR) and the vector network analyzer (VNA). Operation of these instruments is discussed along with a means of parameter extraction to facilitate models discussed elsewhere in this book. The chapter concludes with an interesting discussion of prediction model validation by radiated emission measurements, including the measurement ­uncertainty associated with radiated emissions measurements. Chapter 12 examines differential signaling and the modeling of discontinuities. The advantages of differential signaling are discussed along with industrial architectural standards. Modeling of discontinuities covers multilayered PCBs, bends, serpentines, ground slots, vias, connectors, and integrated ­circuit (IC) packages. The book includes a rich set of appendices of mathematical models and formulae.